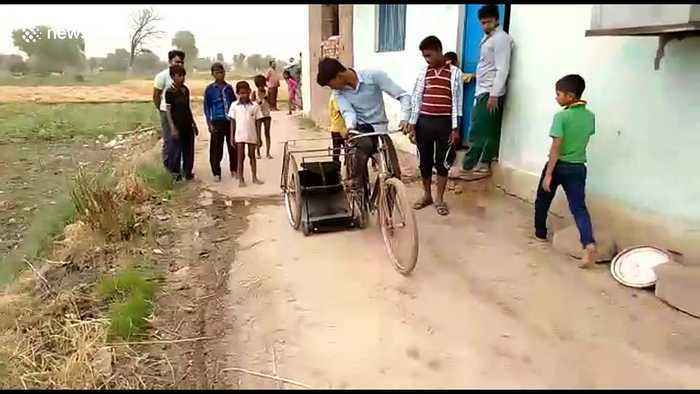 A high school boy from north India designed and built a machine to help clean up the streets, using only scrap and an old bicycle. Jai Prakash Bind, from Mirzapur in Uttar Pradesh state, developed a cycle waste collection machine for sanitary workers, as seen in this clip from April 16. The son of an electrician, Jai Prakash used up his pocket money to buy an old bicycle and then developed the unique machine at his uncle's welding shop in seven months. The teenager was facilitated by the Uttar Pradesh Science and Technology Council during the Sir JC Bose exhibition. The council further directed the mechanical engineering department of the Indian Institute of Technology (IIT) Varanasi (BHU) to inspect Bind's invention and help him acquire the patent. Once corrected and patented, the machine can be used by sanitation workers to collect waste across the nation. Jai Prakash says that he developed the machine to help sanitary workers and wants to become a entrepreneur.